Very Low Ground Current for Longer Battery Life! 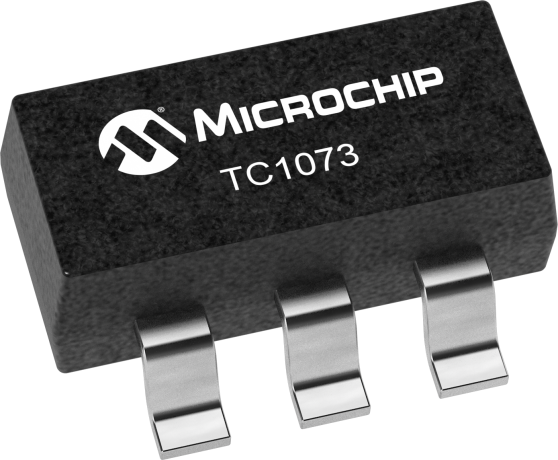 The TC1072 and TC1073 are high accuracy (typically ±0.5%) CMOS upgrade for older (bipolar) low dropout regulators. Designed specifically for battery-operated systems, the devices’ CMOS construction eliminates wasted ground current, significantly extending battery life. Total supply current is typically 50µA at full load (20 to 60 times lower than in bipolar regulators). The devices’ key features include ultra low noise operation (plus optional Bypass input); very low dropout voltage (typically 85 mV,TC1072 and 180 mV,TC1073 at full load) and fast response to step changes in load. An error output (ERROR) is asserted when the devices are out-of-regulation (due to a low input voltage or excessive output current). ERROR can be used as a low battery warning or as a processor RESET signal (with the addition of an external RC network). Supply current is reduced to 0.5 µA (max), and both VOUT and ERROR are disabled when the shutdown input is low. The devices incorporate both over-temperature and over-current protection. The TC1072 and TC1073 are stable with an output capacitor of only 1 µF and have a maximum output current of 50 mA. For higher output current versions, please see the TC1185, TC1186, TC1187 (IOUT = 150 mA) and TC1107, TC1108 and TC1173 (IOUT = 300 mA) data sheets.